Slipper-style, pointed-toe moccasins constructed from smoke-tanned moose hide. The seams of the moccasins were hand-sewn with sinew thread made from finely split and dried animal tendons. The maker has decorated the moccasins with floral designs produced with silk thread embroidery on the vamp (pattern piece located on top of the foot area) and around the cuff. The vamp is edged with a border of “piping” consisting of strands of horsehair wrapped tightly with orange and blue silk thread. Ermine fur has been used to trim the cuffs. Learn more about the Metis or aboriginal clothing - enter 'Metis' or 'clothing' in the search box to your left. 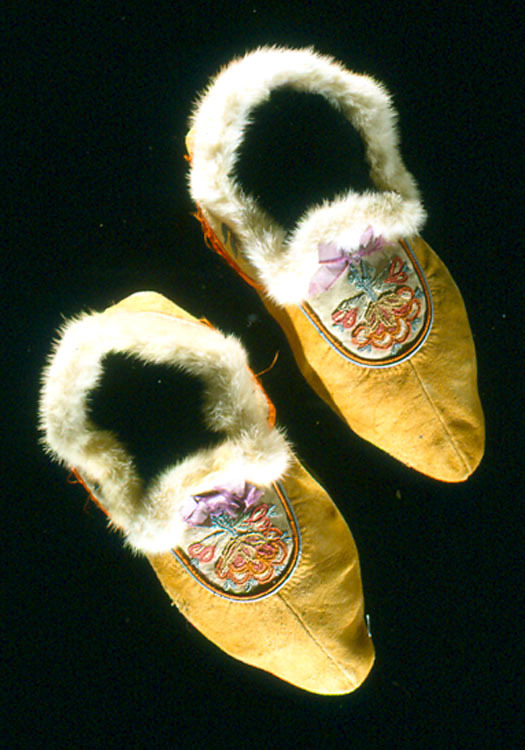 This pair of moccasins was brought from Fort Churchill around 1887 by George Simpson McTavish Jr. Designed to keep out snow and protect the ankle area, outdoor moccasins had a piece of hide sewn into the cuff area that was wrapped around the lower leg and secured with hide thongs. Aboriginal women were renowned for their production of decorated moccasins, and traded them at the various posts for European goods such as cloth, flour and tea. Traditional forms of decoration included the use of natural pigments, animal hair such as moose, deer or caribou hair, and flattened and dyed porcupine quills. By the 1850s, new forms of decoration were made possible with the availability of greater quantities of European glass beads, silk thread, ribbon and cloth. Fine beading needles and scissors were also available. New designs, especially realistic Victorian-period floral patterns, were introduced to Aboriginal women by European teachers working at the mission schools. Known as the “Flower Beadwork People,” the Métis were also responsible for the spread of floral-decorated clothing throughout the subarctic.